An organic cheddar-style cheese called Charlton is the first product to come from Goodwood Home Farm’s new dairy. Cheesemaker Christopher Vowles told Fine Food Digest that further cheeses, including a blue and a Brie are in the pipeline after setting up a cheese rom and three storage units in farm buildings last year. The facility is able to process 1,400 litres of milk a day from the Goodwood Estate’s own herd of Shorthorn dairy cows. 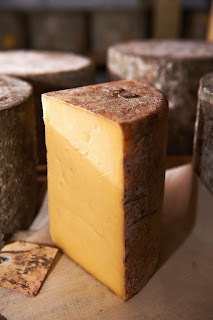 The pasteurised Charlton is made to a traditional cheddar recipe with the cheeses larded and bandaged by hand. “The Shorthorn milk is much creamier than you would get from a Friesan, so the cheese has a lovely richness with a tangy bite at the end,” said Vowles, who previously worked for Lyburn Farm and whose father and grandfather also made cheese. The cheese is available in two varieties, mild (6 month maturity) and mature (12 months), as well as an 18 month extra mature variety. It will be sold in the Goodwood farm shop and local delis. Goodwood Home Farm encompasses more than 3,300 acres, combining arable land with livestock, including 200 dairy cows, 1,200 ewes and 20 Saddleback sows. Most of the produce from the farm is sold on the estate through its hotel, clubhouse and farm shop. It achieved full organic status in 2004.